With “Tribal Progressive Revolution” sample virtuoso Oliver Schmitt aka Sounds of Revolution starts where many other libraries leave off and offers his well-respected sound design to all those in search of exclusive instrumentations with a certain flair. Modern producers can look forward to more than 700 fresh drum, bass and synth loops (all on 127bpm), consisting of a diversity of kick-free loops, constructive loop kits as well as many live recordings with a good portion of dirt. Nothing is left standardized, all sounds and loops have been processed with premium periphery to create sophisticated samples that make your productions stand out from the mass. Furthermore there’s a collection of another 500 significant single sounds such as drums and FX. In short, “Tribal Progressive Revolution” offers likely everything your sample heart is crying for to bring up productions with attitude. The sounds of this library do not only seem to be tailored for genres such as deep, tech or progressive house, but also fit perfectly in the fields of dub and techno. 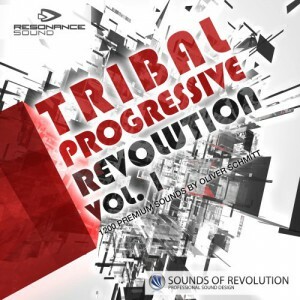 Tribal Progressive Revolution Vol. 1 is the latest offering from Sounds-of-Revolution that caters to the electro-tribal, tribal-tech, house, and progressive house crowd. This sample pack contains 2.80 GB of sophisticated modern sounds such as drums, bass and synth loops with tempos in 127 BPM. Like many of the Sounds-of-Revolution titles, Tribal Progressive is no exception in delivering an assortment of loops in the ‘kick-free’ (meaning no bass kicks) department, as well as loop kits and live recordings. All in all you get 1200 files that are in WAV, Apple AIFF and REX2 formats, plus sampler patches for Kontakt 4 and EXS24. What’s great about this sample pack is that the style presented here really varies. It can be ideal in a wide variety of genres without having to think if the loops fit into a certain mix or not. With that being said, Tribal Progressive is a good starter library that is loaded with first-rate samples. Auch bei dieser Library stellt Oliver Schmitt wieder unter Beweis, dass er in Sachen Qualität und Sorgfalt bei der Auswahl und Nachbearbeitung seiner Samples nicht nachlässt. Der Nutzwert ist auch hier wieder sehr hoch. Auch der Preis geht in Anbetracht der hohen Qualität und der Formatvielfalt absolut in Ordnung. Wer also frischen Wind in seine Sammlung bringen oder einen guten Grundstock legen möchte, kann hier beherzt zugreifen.